There’s more to driving abroad than sticking to the other side of the road — depending on where you're going you could be obliged to travel with all manner of kit. For example, in France you must carry reflective jackets for the driver and all passengers, while a first aid kit is a standard requirement in Austria and Croatia. Most countries recommend carrying a warning triangle, high visibility vests for all passengers, and spare light bulbs, as one or more of these items will invariably be required in the most popular destinations. Each country has its own regulations that will be second nature to native motorists, but might catch British holidaymakers out when driving abroad. For example, you must park on a certain side of the road depending on the day of the week on some roads in Spain, while anyone driving in Romania or Russia will get a fine if caught driving a dirty car. Use the Foreign and Commonwealth Office (FCO) tool to discover the driving laws and recommendations for driving in individual countries. If you're driving your own car abroad, you need to carry your driving licence, vehicle registration document and motor insurance policy. 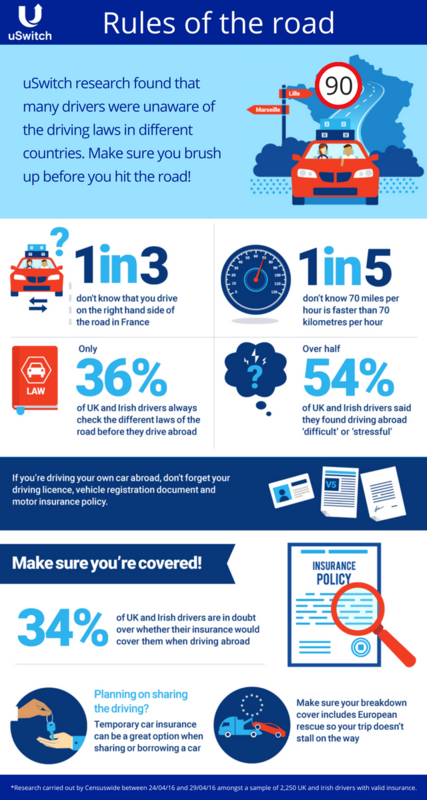 If you're looking for European car insurance, bear in mind that your UK policy will protect you for driving abroad in the EU, the EEC and Switzerland, but this tends to amount to third-party cover only. If you want more comprehensive European car insurance with extras such as breakdown cover, speak to your provider about an upgrade. Some countries will require foreign drivers to carry a ‘green card’ – a form of ID you can get free from your insurer. This document proves that you hold a form of European car insurance. If you are intending to drive abroad outside of the EU, you should also check to see if you need an International Driving Permit — annual permits cost £5.50 and can be bought from the Post Office, the AA and the RAC. Hiring a car is another great way to explore a new country. But it’s not as easy as walking into a car hire company and being handed the keys — you need to do some preparation first. You’ll need to prove you’re entitled to drive, so must bring your driving licence with you. The hire company will also want to know about any endorsements on your licence, so previously would have asked for you to present your paper driving licence counterpart. Since the paper driving licence counterpart was abolished on June 8, 2015, this information has been stored electronically by the DVLA. If the car hire company requires this information, you can give them access by using the DVLA’s Share Driving Licence service. The DVLA's new system allows you to generate a code that the hire car company can use to view relevant parts of your driving licence online. For security reasons, the code is only valid for 21 days — you can generate the code before you go away but if you're on an extended trip you may have to log on or call the DVLA while you’re abroad. Alternatively, some hire companies may accept print-outs of this information. You can read more about accessing and sharing your driving licence details in our guide. Part of the cost of hire will cover your insurance, so you don’t need to worry about being covered. 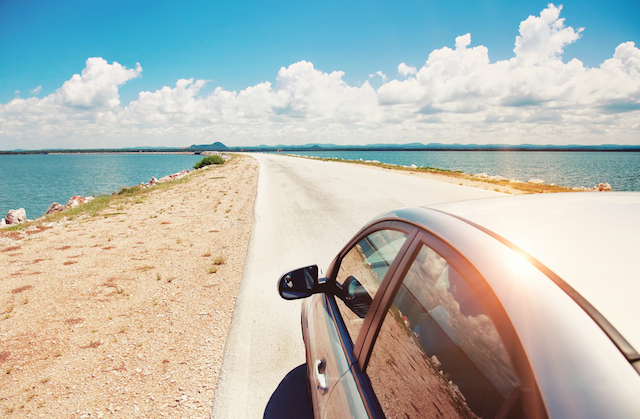 If you're borrowing a car for a trip abroad or you want to share the driving on a trip with friends or family, you have a few options. You could ask the car's owner to add you as a named driver on their insurance policy, but this may not be the best or cheapest option if you only plan to drive their car on a one-off basis. You may already be insured to drive their car if you have 'driving other cars' cover on your own vehicle, but check the restrictions — this type of cover is usually only third party and may exclude driving outside of the UK. In many situations, temporary car insurance is the best option when sharing or borrowing a car to drive abroad. This can cover you to drive someone else's car for 1-28 days, and some policies offer the choice of cover within the EU. The car must be UK-based with valid road tax and MOT. You can find out more about temporary car insurance in our guide. Different countries have their own rules on how to ensure children travel safely — so be sure to check what individual country requirements are. Alcohol rules tend to be stricter for driving abroad than they are here. The UK limit for drivers is 80mg of alcohol per 100ml of blood (50mg in Scotland), while it’s often 50mg per 100ml or lower in the EU. Generally speaking, the police in most European countries are able to give on-the-spot fines or confiscate your car if you infringe their driving laws and fail to pay up, so it pays to be aware of the local laws.